Rabbit monoclonal ErbB 2 antibody [SP3]. Validated in IHC and tested in Human. Cited in 2 publication(s). Independently reviewed in 2 review(s). Recombinant fragment within Human ErbB 2 aa 500-650 (extracellular). The exact sequence is proprietary. Our Abpromise guarantee covers the use of ab16662 in the following tested applications. Is unsuitable for Flow Cyt,ICC,IP or WB. Immunohistochemistry (Formalin/PFA-fixed paraffin-embedded sections) - Anti-ErbB 2 antibody [SP3] (ab16662)This image is courtesy of an Abreview submitted by Mr. Allan Wang. Formalin-fixed, paraffin-embedded human breast, invasive ductal carcinoma tissue stained for ErbB 2 using ab16662 at 1/200 dilution in immunohistochemical analysis, followed by Goat anti Rabbit IgG HRP. 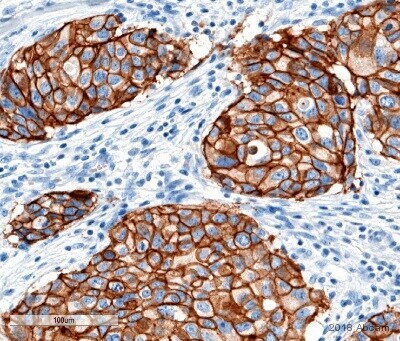 Human breast carcinoma stained with ab16662. Publishing research using ab16662? Please let us know so that we can cite the reference in this datasheet. What are the epitopes of the anti-ErbB 2 ab16899 and ab16662? Thank you for contacting us and sorry for the very long delay of our reply. I have finally been informed by the source of the antibodies that, unfortunately, the epitopes for both anti-Erb2 antibodies ab16662 and ab16899 have not been mapped. The only information currently available is that both antibodies bind to the extracellular part of Erb2. I am looking to purchase this product within the next week: Anti-ErbB 2 antibody [SP3] (ab16662) . The concentration of the product is crucial to what I need it for, although it is not mentioned in the product specification. Could you please let me know what concentration this antibody is at. 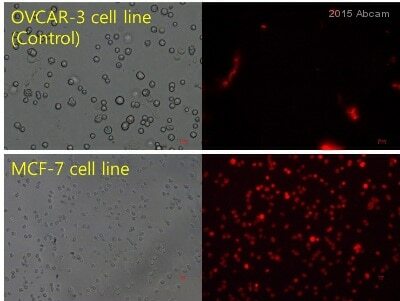 I can confirm that ab16662 Anti-ErbB 2 antibody [SP3] antibody is sold as tissue culture supernatant. Unpurified antibodies, such as those sold as whole antiserum, ascites or tissue culture supernatant will not have a concentration stated on the datasheet. Antibody concentration is usually determined by protein assay, and tissue culture supernatant will contain a lot of other proteins, which means the antibody quantification would not be accurate.